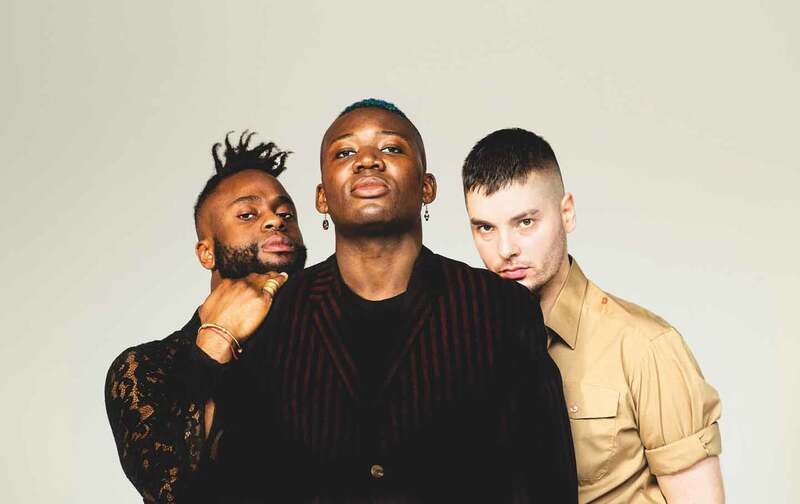 Young Fathers’ sense of what would pass for fitting into the pop-music mainstream is draped in their own idiosyncrasies. For about a decade, Young Fathers have made their name by creating music that pushes the formalist notions of genre and song structure to their limits, while drawing comparisons to groups like TV on the Radio, Suicide, and Massive Attack. Their first two mixtapes, conveniently titled Tape One (2011) and Tape Two (2013), were fuzzy lo-fi blends of “white-boy beat” and “black-boy rhythm.” Dead, their debut LP, was a sensory overload of experimental fusions that earned them the coveted Mercury Prize in 2014. That album’s follow-up, White Men Are Black Men Too (2015), revealed a band continuing to widen their sound palette, and to make their audience uncomfortable. As far as contemporary pop albums go, Cocoa Sugar, released on March 9, is as singular as it is disarmingly gorgeous. The first track, “See How,” features a rumbling bass line that anchors the song’s chorus, which acts like an invitation to listeners—and perhaps to Young Fathers themselves—to drop all their expectations and just “see how it goes.” But no sooner do the feel-good croons come in than the album jolts in the opposite direction with the second track, “Fee Fi,” an eerie song made of tribal drums and piano chords fit for a John Carpenter film. In this way, Cocoa Sugar seesaws its way through 12 tracks, juxtaposing harmonious light with dark discord. The standout “Lord,” for example, begins as a gentle piano ballad but grows harsher as the lyrics turn more sullen. The lines “Her love is blind / Her love is kind / Her love is mine” are set to soft keys and sung in boy-band breathiness. Moments later, the lines “Love wants to give / Hate wants the thrills” are delivered in a stark monotone atop ragged stabs of reverb. The song evokes hopefulness and dread, all at the same time. The vocals on Young Fathers’ previous releases were often distorted and obscured by layers of electronic feedback; but here, everything is right out front. To call Cocoa Sugar “sparse” would be misleading, but by the group’s own standards, it is certainly restrained. Still, their sense of what would pass for fitting in that mainstream box is draped in their own idiosyncrasies. They know how to write catchy hooks and melodic bridges that stick with you—as on “In My View” or “Picking You”—but those elements come packaged in clamorous instrumentation and clouded by ambiguous lyrics. With its winding riddim, “In My View” may be the album’s most orthodox song, but taken with the video, also its most self-referential. The hook sets up a pair of illusory contradictions: “In my view, nothing’s ever given away / I believe to advance that you must pay / In my view, love will never come my way / So when I leave, you’ll be dancing on my grave.” Likewise, the video features a stunning set of images—a young man bowing reverently before a priest, a woman emotionally embracing her lover, an older gentleman in joyful dance—before it reveals itself as a how-to guide for “The Art of Making People Care” (the steps are to “Hook Me In The First 5-Seconds”; “Use Shock & Surprise”; “Give Me Emotional Highs & Lows”; and “Show Me Your Softer Side”). In that way, the song and video serve as an allegory for Young Fathers’ attempt to make a more mainstream record; it’s easy to imagine that these directives were pulled from a music executive’s e-mail to the group. Young Fathers have always coaxed listeners into a more active engagement with the music, but now they’ve perfected their own formula by streamlining some aspects of it and exaggerating others. Cocoa Sugar is their most accessible record to date because of its overt use of pop-music formulas. On the other hand, the group’s ironic self-awareness situates the album in the sweet spot that’s just outside their comfort zone and just inside a pop audience’s. From the cover art down to the final abrupt note, Cocoa Sugar revels in its bitter-sweetness—at once unsettling and captivating, off-balance yet still beautiful. Briana YoungerBriana Younger is a New York–based writer whose work has appeared in The Washington Post, Pitchfork, Rolling Stone, on NPR, and elsewhere.